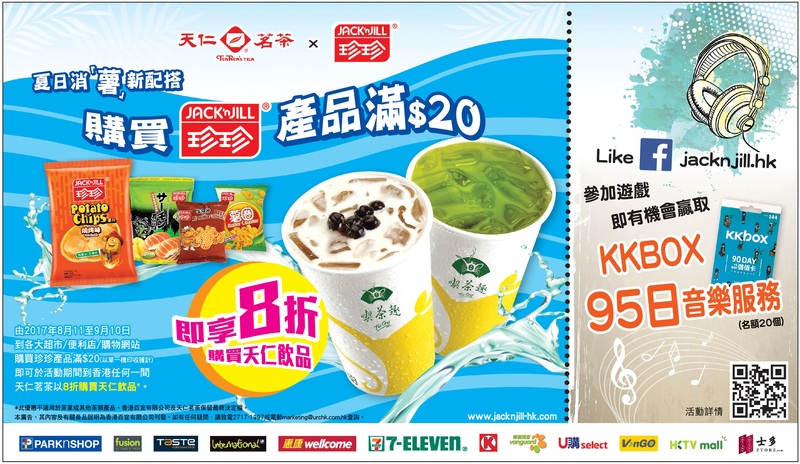 From 11 Aug until 10 Sep 2017, with purchase of $20 or above of Jack ‘n Jill products in a single transaction, consumers can enjoy 20% off any TenRen’s Tea drinks (not suitable for tea leaves and other tea products) at any TenRen’s Tea shop in Hong Kong upon tender of printed receipt. URC Hong Kong Co. Ltd. and TenRen’s Tea reserves the right of final decision. © 2017 Jack 'n Jill. All rights reserved.